Yet another opportunity to reach out about the wonders of used coffee grounds with a guest post of mine ‘Have Your Latte and Compost it too’, on 40 Mums Club. Star of the show is a big home grown tomato, that was later enjoyed with some fava beans and a nice chianti (edit 12/2 – I have come to the realisation that this line is not funny, never was, and will no longer be included in any future dealings with anyone or anything. Sometimes I use that line when I am about to eat fava beans, and say it to the can). So do consider how you can have your latte and compost too, it is almost as easy as drinking the coffee. Tags: coffee grounds, compost, Fertilizer, Latte, worms. Bookmark the permalink. Great website! I compost, but forgot about the coffee grounds. They’re going into the compost starting tomorrow! That is what we like to hear! Thanks for stopping by and I hope all that composting gets you great healthy soil. What a great idea to have a late and compost it too! 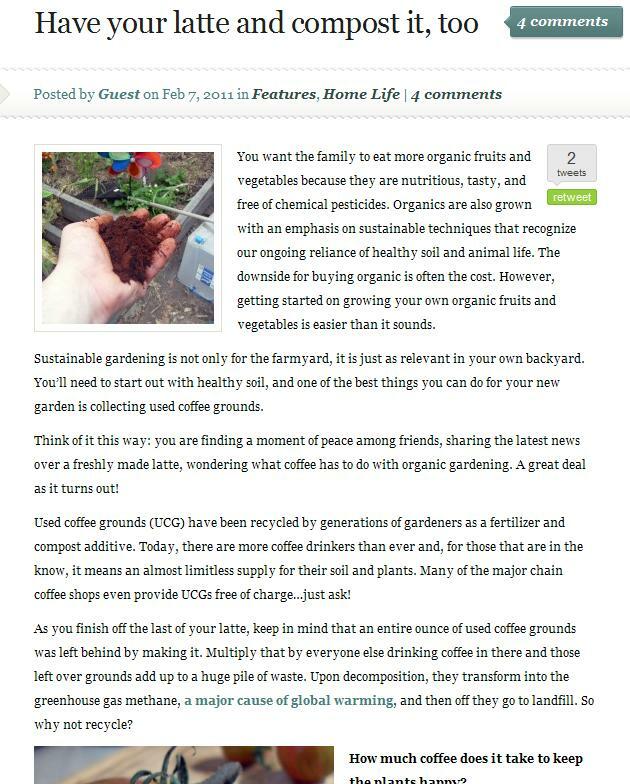 I’ve been composting for many years and do enjoy drinking coffee and then using the spent grounds in the compost bin. So easy to do and really good for the garden. Thanks for the article also, I go to the 40 mums club site all the time and it is so good that they are posting articles like this. thanks for making a difference! !